Friday Nights at PJ's Sports Bar Means Karaoke! 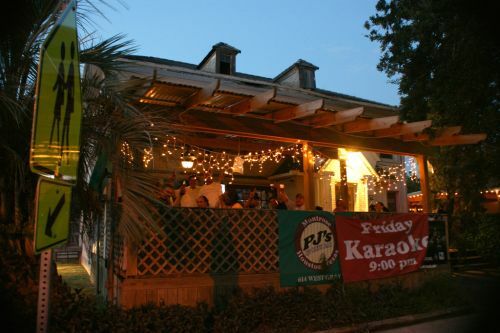 You are here: Home › Things to do in Houston › Friday Nights at PJ’s Sports Bar Means Karaoke! Friday Nights at PJ’s Sports Bar Means Karaoke! The real estate in Montrose tends to wear a lot of hats. Often it’s a bar AND grill, hair AND nails, tire repair AND sushi… wait, no. PJ’s Sports Bar isn’t exactly a tire repair and sushi, but the combination of theater, karaoke and fantasy football certainly make it a mixed experience. It’s a rare nugget that can cater well to all facets of the drunken heart. PJ’s Karaoke night, Fridays at 9 pm in their intimate upstairs area, draws a blended crowd. From the kids who undoubtedly did theater in high school to the ones who certainly played football to the ones who graduated high school before you were ever a thought: you’ll find anyone at PJ’s. You’ll also have a hard time feeling inadequate, though it was just my luck to go after a powerhouse who delivered “Find Your Grail” from the Broadway musical “Spamalot.” The gentleman who went after me, however, had a great time singing some Metallica, though he was far from an expert. It’s hard to really capture what makes this different from a regular Karaoke bar except that the audience is such a diverse cast that the climate is anything typical of Glitter or Spotlight Karaoke. This is Karaoke for the people who do not Karaoke. 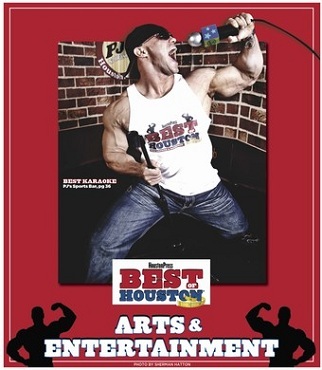 In fact, Houston Press voted it the Best Karaoke of 2012 in their “Best of Houston” superlatives. But, PJ’s doesn’t just cater to the exhibitionists among us: they also cater to the exhibitionists among professionals. This month they’re featuring live performances of “Spaghetti Code,” a dark comedy put on by the Horse Head Theater Company on Saturday, Sunday and Monday. They were also voted one of the Best Sports Bars in ‘Merica by ‘The Chive’ and feature a Fantasy Football league. 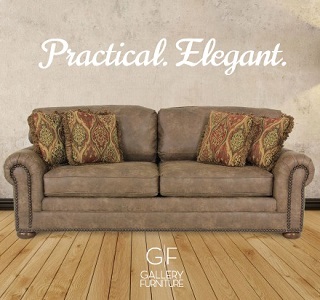 It is, after all, a Sports Bar first and foremost. Check it out this weekend, because I know where I’m going to be!